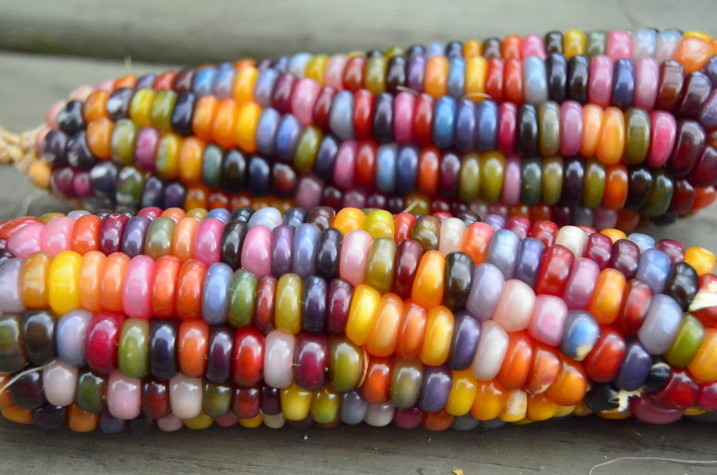 In conjunction with Lee-Ann Hill and the Rocky Mountain Seed Alliance, Greg Schoen, the orginal steward of Glass Gem, would like to offer packets of ‘Glass Gem’ rainbow corn to you at no cost, so you may grow it for your enjoyment and to share freely with others in your community seed exchanges and seed libraries. Your growing of this seed will also help with the corn section of the RMSA Grain Trials. By personally increasing this seed, you make it possible for this unique landrace to continue to evolve and be available ‘open-source’ to future generations. This seed is from corn grown from Greg's original stocks, in a manner to ensure its full genetic diversity. He sent Lee-Ann 50 packets of 300-plus seed each, so that your grow-outs can contain a sufficient number of plants to maintain the genetic ‘library’ of this corn. These packets will be available to you on a first-come first-serve basis. Please fill out the application below or email lee-ann@RockyMountainSeeds.org to order your packet. If you have sufficient space to grow this corn and are in a climate that allows a minimum of 120 days of frost-free growing season, then Glass Gem may grow well for you. It does best where summer temperatures are warm but do not regularly exceed 95 degrees F., and where rainfall is not excessive during the later summer when the corn is ripening. Suggested growing instructions will be sent with your packet of seeds. If you have any questions or experience technical difficulties with this application, please contact bill@rockymountainseeds.org. Thank you for your important contribution to creating a more resilient Rocky Mountain region! I will share my seeds with other seed stewards. Are you a commercial seed grower/retailer/broker or professional seed researcher/educator? If you answered “Yes” to the question above, please answer the following question. Describe your seed enterprise, its size/scale and your target market. If you are an educator or researcher, tell us a little about your work. Give your permission to be listed as one of the resources in the searchable Seed Steward Directory on the RMSA website. This is a great way for us all to build a strong community of seed savers.